As I was going through my local comic shop, trying to catch up on weeks of missed books, I realized that AfterShock Comics’ Her Infernal Descent had been released. I immediately picked it up, as I have been waiting on this book since it was first announced. Let me say right off the bat, I am not disappointed. From writers Lonnie Nadler and Zac Thompson (The Dregs), artist Kyle Charles (Roche Limit), with colors by Dee Cunniffe and letters by Ryan Ferrier, this is one hell of a debut issue, pun intended. This unconventional book is a modern-day retelling of Dante’s Inferno, with the protagonist being a middle-aged woman named Lynn, who has lost all of her family and now lives a pretty hollow life. Enter the ghost of William Blake (yes, that William Blake), who offers her a chance to see her family again, if she can traverse the nine spheres of Hell. The story, from the pacing to the crazy page layout, is nothing short of outstanding. I am a fan of the writers, having enjoyed The Dregs immensely. This book delivers a very on point and emotional issue. The loneliness that resonates inside Lynn at the beginning of the story is so surreal, I think we can only relate to it at some point in our lives. Charles’s artwork is a perfect fit here, as the co-creator of this title delivers visuals of a very different Hell. If you follow the reviews on this site, then you might see a pattern. If a book has to do with the afterlife, I most likely have reviewed it. This book ranks up there with some of the best I have had the pleasure of reading. To see a Hell full of philosophers, writers, artists and such, it was a sight to see. For me, major standouts being Jimi Hendrix and Edgar Alan Poe. We have the elements of Dante’s Inferno wrapped in a more modern setting, and it works so well. What is Lynn sorry for? How is she responsible for the death of her family? Can she make it through Hell literally to see them again? 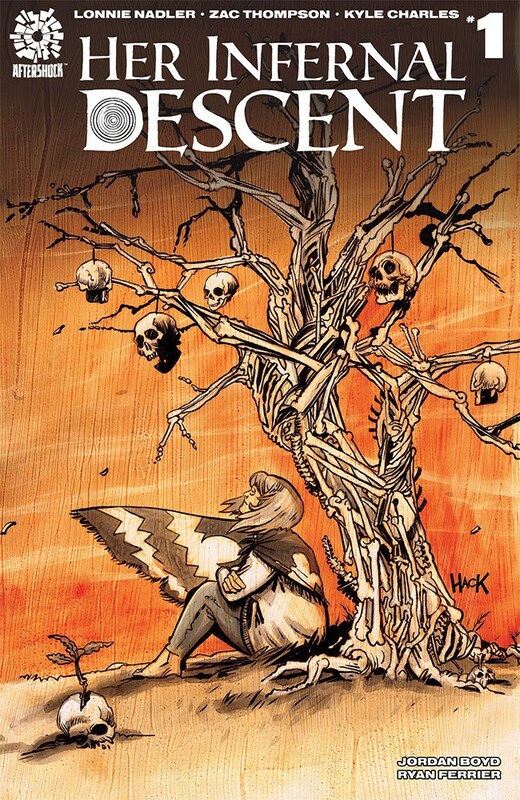 Her Infernal Descent is not like most comic books, and that is a great thing. I highly recommend this amazing debut issue.